Campaigners hoping to preserve Rwanda's endangered mountain gorilla are attempting to raise awareness of its plight by making a game simulating the lives of the animals free to mobile phone users. 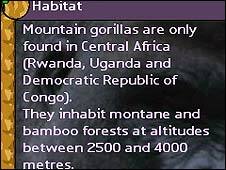 The game Silverback, in which the player guides a gorilla through life in its natural habitat in Volcanoes National Park in northern Rwanda, was first created in 2003. Now it has been tweaked and re-released as a free download for web-enabled mobile phones, in the hope of highlighting the ongoing plight of the gorillas. "We had to make sure the game was rooted in some kind of reality," Ken Banks, who designed the game in association with campaign group Flora And Fauna International (FFI), told BBC World Service's Digital Planet programme. "We didn't want a Donkey Kong style game, or a game where gorillas are chasing people or doing bad things." Although the download is free, FFI are hopeful people will donate around £5 to help their work. 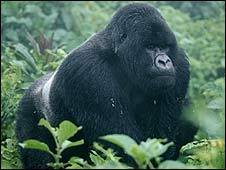 FFI's Africa Co-ordinator Bruce Liggett explained that Virunga National Park is an "island in the sea of humanity". But what is supposed to be a haven for mountain gorillas is being put under great stress, even at peaceful times, by human beings. "Many of the resources the people need - water, fuel, wood, even honey and meat - come from within the national park," he explained. "There are a lot of pressures on the forest and the gorillas." And now there is the added pressure of humans in the region fighting each other. "You can't do anything positive in conservation while there's a war going on," Mr Liggett said. "So the gorillas are not receiving the protection they should." Mr Banks said that his design team had focused on trying to reflect these pressures in the way the game is played. 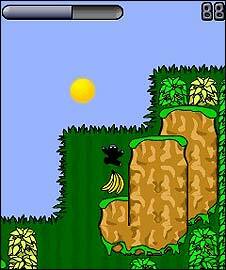 "In the first level, you start as a baby gorilla - you are lost, you have to find your family and make your way back. "Then on subsequent levels you have to fend off rival silverbacks, find yourself a mate, start your own family, lead them to safety, avoid poachers and snares. "We try to lead people through the life of a mountain gorilla to give them a sense of the challenges they face both naturally and through human threat." However, Ian Bogust, author of Persuasive Games: The Expressive Power Of Video Games, said that the game designers may have to do more to get the players of Silverback truly involved. He said they should think about how to make a game "that might then lead a player from a point of total ignorance to a point of complete engagement". "To a point where they're really willing to spend time and money with a cause rather that than assuming that after one play you're won over with the cute little pixelly gorilla, and ready to open your wallet for him."